Here comes another detailed comparison and review – this time the category is double strollers – but not just any – only those you can take off road on rough terrain and where kiddos ride side-by-side. I prepared a detailed comparison of 4 major all-terrain side-by-side double strollers available in the USA in the price range between $500 and $1000. 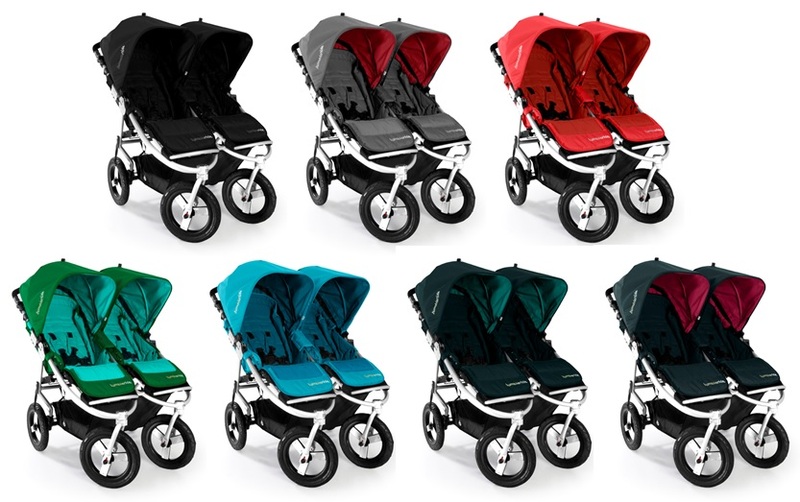 All four strollers actually fall into a tighter price range between $600 and $800 – Mountain Buggy Duet being the least expensive and Trends For Kids Twinner Twist Duo being the most expensive (click to enlarge picture). So if you are looking for a quality double stroller, expect to spend this amount of money (+ additional expenses on accessories). Any double stroller below $500 will not be very versatile nor sturdy. Of course, you can go with the Bugaboo Donkey but then we are doubling the cost of the stroller and my focus was on strollers that do not exceed the 3-digit price tag. Now let’s look at the details. All of these strollers are considered all-terrain which means you can take them for a stroll through rough terrain and even a sandy beach. However, the wheels on Duet by Mountain Buggy are fairly small for an all-terrain stroller at just 10″. Personally, I would like to see at least 12″ tires on an all-terrain stroller. With the exception of BOB Revolution SE Duallie (which has 3 wheels) all strollers have 4 wheels with rear wheel suspension and swiveling & lockable front wheels. BOB’s single front wheel comes in handy if you are purchasing the stroller strictly for jogging. All strollers have two forward-facing side-by-side seats with 5-point harness. Bumbleride Indie Twin has a 5-point breakaway harness helping to prevent entanglement which is a neat feature. As for the handlebar and the option to adjust its height, only BOB fails to provide this feature. All strollers have independent seats which is important because you want to be able to adjust and recline each seat separately depending on each child’s needs. However, only Bubleride and Trends For Kids allow you to independently adjust footrests. Footrests on Mountain Buggy and BOB are not adjustable – to me a significant disadvantage, particularly when it comes to babies. Two carrycots attached (if you have twin babies). I am now going to jump a few rows down, but since I am already talking about car seats let me mention that you will have to purchase these accessories separately – carrycots, car seats and car seat adapters. Now here it becomes tricky. First decide which stroller you want because most of them come with limited number of car seat adapters. BOB, for instance, offers just 1 car seat adapter for Britax B-Safe infant car seat. Mountain Buggy offers just 2 car seat adapters – one for Graco SnugRide and one for Peg Perego Primo Viaggio. Trends For Kids offers 4 car seat adapters – for the above mentioned Graco, Peg Perego, Britax and also for Maxi-Cosi Mico. Here is where Bumbleride excels – Indie Twin comes with a complimentary universal car seat adapter which gives you the option to attach 8 kinds of infant car seats to your stroller. Please refer to the table to see the model names. This will come in handy if you have one baby and one toddler. If you have twin babies and would like to attach 2 infant car seats to your Indie Twin, then you will have to purchase the car seat adapters and they will accommodate 3 kinds of infant car seats: Maxi-Cosi Mico and Prezi, and Cybex Aton. Another cool feature is the ability to attach a toddler board for an older sibling – this you can do only with Mountain Buggy, and as of summer 2013 also with Bumbleride. 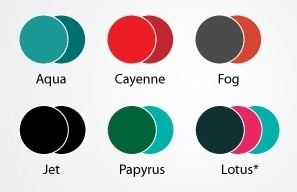 Sadly, color options of BOB, Mountain Buggy and Trends For Kids are underwhelming – boring and so predictable. When it comes to dimensions, Mountain Buggy Duet is the slimmest side-by-side double stroller on the market – only 25″ wide. The widest double stroller is BOB – 30.5″ wide. BOB also has the largest fold. If you have a small car trunk / limited storage space, Bumbleride Indie Twin will be your friend because it folds small – measuring just 32″ in length and 15″ in depth with wheels attached. That’s pretty impressive. It’s also the lightest of the four stroller models and it has the largest cargo basket. Again, very impressive. Weight capacity of Indie Twin is 90 pounds / 45 pounds per seat – that’s an average weight of a 5-6 year old child. Perfectly sufficient. I do not own Bumbleride Indie Twin so this time there are no pictures of my son in the stroller. But I do own Bubleride Flite (umbrella stroller) and have been using it for 2 years now. I feel compelled to mention that Bumbleride’s customer service is beyond excellent. I have dealt with their customer service a few times and they always do anything possible to help and please their customers. I wish every company had people like Kandi from Bumbleride, life would be much easier. I do not own any BOB, Mountain Buggy or Trends For Kids stroller so I cannot speak about their customer service. If any of you have any experience with their customer service, please feel free to share in the comment section. Photo credit: images via provided links. 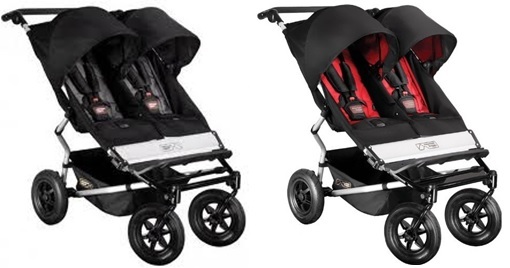 love this side by side… I want this for other strollers on the market. It would make picking one sooo much easier! I have looked at the BOB but may have to check out the bumbleride!! Hi!I have a 4 year old girl and going to have a second baby soon.Planning to buy the Maxi Cosi Pria 70(read your reviews).Wanted recommendations for a stroller to carry the baby around.Waiting to hear from you.Great blog!! Thanks! Glad the review of the Maxi-Cosi car seat was helpful – my son is going to be 3 this summer and we still love it 🙂 As for the stroller, it all depends on your budget and needs (i.e. do you need an all-terrain stroller, a city stroller, lightweight etc). I just had a second baby myself and got the UppaBaby Cruz – I wanted to keep the cost of the stroller below $500 and I needed the stroller to have a reversible seat, toddler board attachment option for the older sibling, large under-seat basket, large canopy, one-hand easy fold, and I wanted it to be compact and fairly lightweight. Cruz was the only thing that gave me all I wanted in my budget (the toddler board is sold separately but it’s useful). UppaBaby’s Vista has larger wheels so if you go off road often that might be something you might like, however, the Vista is larger and heavier. But it does come with a bassinet. Depends on your needs. 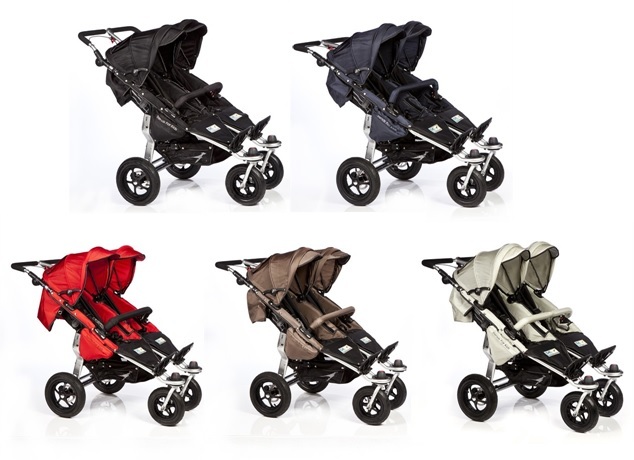 Let me know what it is that you expect from the stroller and I will send a few recommendations your way. FYI – I don’t think you need a double stroller since your older one is 4, a single stroller with a toddler board would probably be best. Hi Veronica!Looks like your requirements all that I need.Lightweight,Easy to handle,Carry the toddler too when cranky,basically just for walks in the neighbourhood or trip to the mall.Below 500 is perfect!Please also reccomend the best place to get it. While we’re at it let me know if you did a post on bassinets/cribs/playyards etc.Iknow you might wonder why is this second time mommy asking so many dumb questions.Well I think we ended buying tons of useless things the first time round want to avoid that now.My situation is I do have a crib n changing station on the first floor but since I know my mom wouldnt be able to do keep coming down to the main floor with the baby which is where we spend most of the day I’ve converted my study into a nursery.I received a bassinet but Im still debating whether I should keep that n get something longterm.Im also wondering if I should reuse my daughters playpen instead of getting something new.I had lent it to a neighbour so just a little dilemma…please advise!Looking forward to hearing from you!Thanks again!!! If you do need an all-terrain, than I would vote for the Bumbleride Indie, but the new 2013 is a little over $500 (although 2012 is on Amazon for less). I usually go to Buy Buy Baby or other baby stores to test and play with the stroller in person. I ended up getting mine on Amazon. As for the bassinet, these frustrate me because their life span is so short… I would reuse the playpen if it’s in working condition. In case people throw money at you (or want to buy you something) then I love the BabyHome Dream Cot – it’s $300 so it is not cheap, but it’s bigger than a regular bassinet so it will easily last until 6 months. It has a stationary position, than wheels so you can move it around the house with ease (to your bedroom for night and all over the place during day time), and than swing so you can rock the baby in it, which is just genius. It folds small and is very lightweight which is also a plus. If you want new stuff you can always ask people for Amazon Gift Cards instead of gifts or a baby registry – then you can buy anything you want, Amazon sells literally everything 🙂 Good luck!! What about Baby Jogger? I own Baby Jogger City Mini GT & love it! It accommodates taller/older kids so much better because I think it has taller seat back. I personally think 3 wheeled all terrain strollers are superb. It’s so much easier to push them & they have awesome maneuverability! That’s why Bob is great. Just do a pushing comparison fully loaded on a bumpy surface & you’ll see what I’m talking about. Baby Jogger came out with a new double all terrain stroller with 3 wheels. It will probably be the best of all worlds. I’ll have to check it out. I believe it’s called Summit x3 or something like that. That’s a great stroller but for me it is really important that the stroller has a reversible seat and the baby can face me. I don’t jog or go off terrain so these things were not important to me personally. I did recently use the Cruz in the park and it did fine on the grass (the wheels are not that small). But as I said all depends on your preferences – make a list of things that are the most important to you and chose a stroller that accommodates them all. Hi Veronica!Thankyou so much for all the advise.I’m planning to buy the Chicco Keyfit Magic.I think it’ll just be more convinient to put a carseat in the stroller than pick up a sleeping baby.For the stroller it is the Uppababy cruz.Willl order from Amazon as there’s no Buy Buy Baby store in Richmond.Will look forward to more posts ob the blog:)TC. Thanks for all the reviews… it was very helpful!… I do have a bumbleride indie twin and I love it, the only thing is that my 3 year old is too tall for the foot rest and my 2 year old sits perfectly in it. I only bought it last April and now am looking to buy a different one! Thinking about the Duo!! Thank you so much for your feedback, Amy! Very interesting comparisons. However in my opinion and also of one very experienced knowledgable man I know….the bumble ride cannot even touch the engineering of he bob Duallie. Hands down it is the best jogger in the market. Thank you for your feedback, Suzy. The Bob Duallie is a great double stroller for jogging, however, it lacks many standard features – see the comparison table. This makes the stroller unfit for people who need to use it on a daily basis for all kinds of errands. Particularly, if you have infant twins, this stroller just does not deliver. This is a great comparison and really helpful in doing my research. I have it narrowed down to the bob and the bumbleride. I have a single bob and love it. I did notice that you say the bob is only compatible with the britax carseat, however they have adapters that fit many more! I have a chicco key fit and the adapter that goes with it and they do have one for the duallie too. Thanks for the great side by side!! We have the tfk twinner and were hoping to still use our chicco keyfit 30 that we used with our first daughter. Would any of the adapters for the tfk “work” for the chicco keyfit car seat? Thank you for your feedback. I am not sure it would work – since Chicco is not listed under their compatible car seats / adapters, my guess would be no. I suggest contacting the company with any particular questions.